Foreign Affairs Minister Chrystia Freeland says she's deeply concerned about recent videos that appear to show Canadian-made armoured vehicles being used by Saudi Arabia against its own citizens. Foreign Affairs Minister Chrystia Freeland says she's "deeply concerned" about recent videos which appear to show Canadian-made armoured vehicles being used by Saudi Arabia in a crackdown against its own citizens. Freeland says she's instructed her officials to "urgently" investigate the matter and determine whether the vehicles in the videos were in fact armoured personnel carriers made and exported to Saudi Arabia by Terradyne Armoured Vehicles, a company based in Newmarket, Ont. She says the investigation must be done energetically but also "very carefully" to be sure Canada is "acting on fully reliable information we can stand by." She's not saying what action might be taken if the vehicles are proven to be Canadian-made, other than to say "we will respond accordingly." In the meantime, Freeland says Canada's concerns have been conveyed to Saudi Arabia. She's also personally spoken to the European Union's foreign minister, Federica Mogherini, about Canada's concern and investigation into the matter. 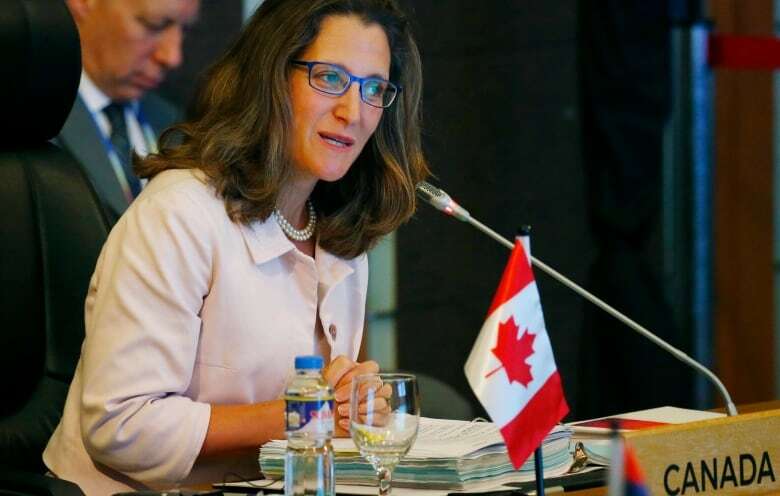 "We are absolutely committed to the defence of human rights and we condemn all violations of human rights," Freeland said Monday in a conference call from the Philippines, where she was attending meetings with her counterparts in the Association of Southeast Asian Nations. "We also are very clear that we expect the end users of any and all exports to abide by the terms of our export permits." Armoured vehicles have appeared in video in news and social media posts from Saudi Arabia's Eastern Province, where the Saudi government is attempting to stamp out unrest among the region's minority Shia population. Some experts have asserted that the vehicles are Terradyne Gurkha APCs. Almost from the moment Justin Trudeau's Liberals took office, his government has been under fire for allowing arms exports to Saudi Arabia, which is widely denounced as one of the world's worst abusers of human rights and has been censured by the European Union and a number of western countries. Canadian export controls prohibit the sale of arms to countries with a "persistent record of serious violations" of their own citizens' human rights. Yet the Trudeau government issued export permits in 2015 for the sale of General Dynamics light armoured vehicles to Saudi Arabia, a $15-billion deal that had been approved by the previous Conservative administration. The Liberals argued at the time that it had little choice but to honour the deal made by the Tories. This story has been updated from a previous version that incorrectly referenced, in a headline and a photo, Canadian-made light-armoured vehicles known as LAVs. In fact, the recent reports of Canadian-made vehicles being used by Saudi forces in Qatif province involve armoured personnel carriers known as APCs, which are a different vehicle made by a different manufacturer than the LAVs.